The Kindness Rocks project began with one woman dropping rocks painted with inspirational messages along the beach where she walked. Her goal was to leave encouraging thoughts for others who need a kind word to brighten their day. 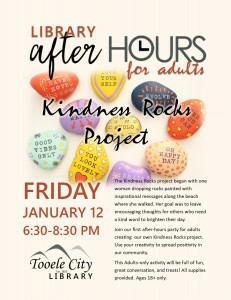 Join our first after-hours party for adults creating our own Kindness Rocks project. Use your creativity to spread positivity in our community. This Adults-only activity will be full of fun, great conversation, and treats! All supplies provided. Ages 18+ only.